Again we have a year ended without the reward of feeling in our souls the projects that Stevie Wonder have promised to us. All who love the music of Stevie Wonder are patient, while blindly confident in his qualities as a musician and transmitter of emotions. We know he's a legend, we know that there are still many surprises to enjoy, as his music is a holy bible to guide us regardless of color or gender. Versatile man, full of sensitivity and very demanding of himself, trying to reach absolute perfection. Perhaps this is the reason for the delay the publication of new work. But in the review about happened this 2011, we see that Stevie activity has not stopped. Collecting awards and honors for his contribution to music, most notably was his entry in the Apollo Theater's Hall of Fame in New York. Collaborations with other artists/friends on their albums or tributes. This we can see him on the 60 anniversary of Sting, the 50th anniversary of President Obama, Tony Bennett - When will this album of duets? 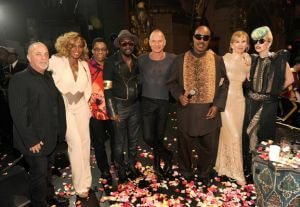 - The tribute to Oprah Winfrey for his farewell show, to Chaka Khan, or the great artists of old soul. More collaborations, this time on albums by Pixie Lott, Steven Maysa or Drake. 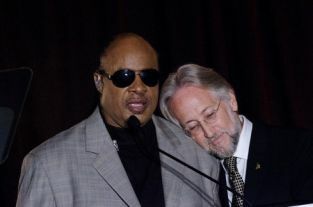 His presence and saddest moments, like the farewell of the founder of the Motown Museum, and the company's executive in his infancy, Esther Gordy Edwards, or Yvonne Whitmore, his teacher in the 60's in school to blind. 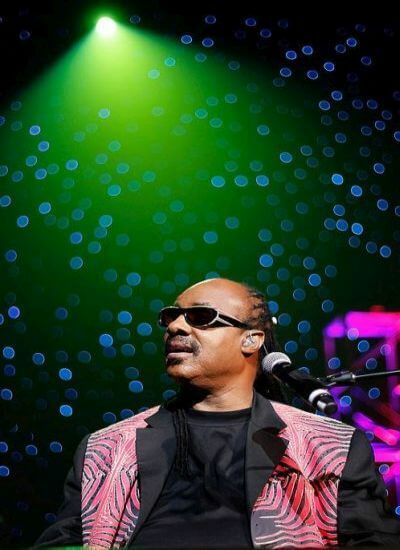 And of course, again we find the Stevie Wonder brighter in live concert, where magic and charm are captivating wherever he perform. The Olympic Games in Athens, the Curacao Jazz Festival, the Abu Dhabi, Austin City Limits, or the Rock in Rio, are some of the many appearances of Stevie where he looks happy and enjoying as if he had started in the world of music. And if patience is a hallmark of Stevie's fans, the optimism is another of the qualities that distinguishes us. Knowledge of the existence of new material in the form of songs as "Ten Billion Hearts", leaves us enough encouragement to think that this year 2012, is the come to light of the expected musical projects. With that desire and hope that Stevie send us his love in songs, remember the song "Send One Your Love" performed at the Rock In Rio 2011.